There is a long list of pressures that accompany being a Division-I student-athlete. The University of Iowa has its highly-publicized sports teams that compete in front of sold-out crowds and are swarmed by the media following their games and practices. But outside of those select programs, sit the rest of the Hawkeye sport teams, who put in their share of time and effort despite the lack of outside attention. When the Iowa field-hockey team wasn’t competing in one of its 17 regular-season games this fall, the squad stayed busy between juggling school and the responsibilities of their sport throughout the day. Q: The hardest workout you’ve ever done? A: “The hardest workout I’ve ever done was in Carver-Hawkeye Arena during my sophomore year in the spring. We were partnered up and while one partner had to run two laps against our other teammates at the top of the concourse, the other partner was to be jumping rope. The partner running had to jog down a flight of stairs to the course and run back up them (twice). Once the partner running and doing stairs was done, then the two would switch. The Iowa basketball team plays nearly 30 regular-season games this season, travels to over ten states and even out of the country once. But when the Hawkeyes aren’t suiting up for a game, the team stays busy during the week. Q: What is your best memory from the season so far? “Without a doubt our trip to Cancun over Thanksgiving break. It’s weird not spending that time with my family and with my team instead, but being in the gorgeous weather helps make up for that. The same uniform, different styles. The same city, different locations. The same mentality, different goals. 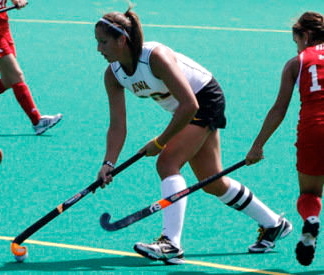 The University of Iowa features 22 athletic teams, all of whom wear black and gold. But aside from the visual resemblances shared, each program proves unlike the other. Of the 22 Hawkeye sports teams, some are highly publicized and regularly receive national attention, but a majority of the Iowa’s smaller sport teams receive limited media attention in a given year. Between the scarce coverage and minimal hype surrounding Iowa’s less prominent programs still lies the pressures and responsibilities that come with being a Division-I student-athlete. No matter the sport, a college athlete’s head coach becomes their new authority figure on campus. But unlike athletes in larger sports, like University of Illinois basketball player, Lana Rukavina, who said the pressure to perform well stems directly from her coaches, UI sophomore volleyball player, Allison Straumann said the pressures she feels comes from multiple outlets. 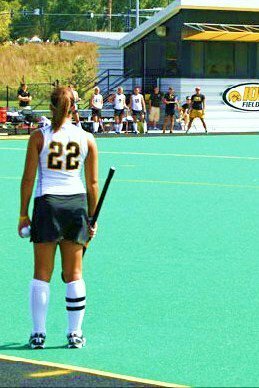 Like Straumann, UI field-hockey player and senior, Sarah Pergine, agreed the pressure to perform at a high level branches from multiple people, but the Collegeville, Penn., native also added that for her, there’s another non-human source that produces an even stronger push. Eastern Illinois volleyball player and senior, Erin Hake, said a unique situation in her program this season is the reason she felt this year’s pressures were unlike those she’s felt in previous seasons. Like Rukavina, and a majority of the other names listed on roster’s of larger sports teams, is on a full scholarship to play basketball at Illinois. Straumann, Pergine and Hake are also on full athletic scholarships to their universities. But unlike Rukavina, who said since basketball is her top priority, academics are rarely a source of pressure — Straumann, Pergine and Hake felt the opposite. Hake, a Marion, Iowa, native, said her Midwest location and the lack of professional opportunities in volleyball, are the reasons her academics have always been her top concern at EIU. Field-hockey does not offer a professional future after college, either. Pergine said there are national field-hockey teams, but that she has never considered pursuing the sport after graduation. Pergine said coming to Iowa and knowing the Hawkeye roster would be the last lineup card her name would ever appear on, has positively impacted her career in Iowa City. Christina Johnson, Ph.D., and lecturer in health and human physiology, with an emphasis in sports psychology, said an student-athlete’s attitude towards their sport can greatly impact their academics. “I think in terms of life outcomes, the number of student-athletes who will go on to play their sport professionally is really so small,” Johnson said. “The percentages are not great at all and definitely in women sports, professional basketball is about only option a female athlete would have. No, there are not usually reporters lining press row leading up to the start of a regular season volleyball game for Straumann or Hake, nor do the bleachers at Iowa field-hockey games typically contain more than a few hundred fans. But this lack of outsider attention given to smaller sport teams does not make maintaining the integrity or image’s of these programs any less important. Like Rukavina, Hake said she and her teammates are expected to carry themselves in a deliberate manner when out in public. Hake said this rule is strictly enforced on her team, and that she had the misfortune of “learning the hard way,” her first year at EIU. A majority of students who go away to college pay hefty sums of money in exchange for the four years of hospitality. But in rare, special instances roles get reversed and universities find themselves passing the big bucks in the opposite direction. As a result of these unusual circumstances, the recipients of these highly-prized scholarships have their fair share of obligations to their universities. Whether that responsibility be juggling a full course load, participating in community service events or hitting the gym for practice, these student-athletes are held accountable for their every move. As college athletes arrive on campus they wave goodbye to their parents then turn around to greet their new authority figures. 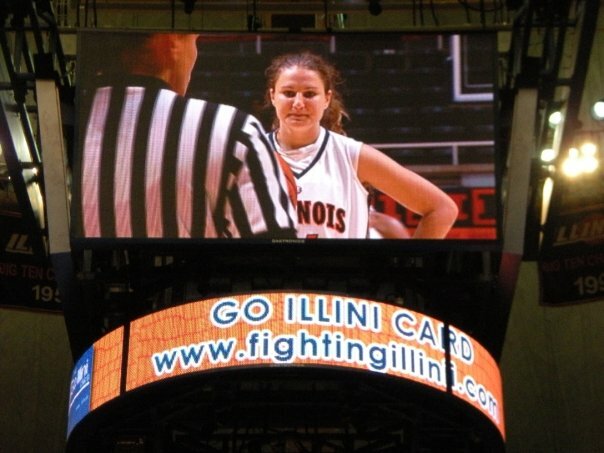 Lana Rukavina, University of Illinois basketball player, said despite the importance her school and its fans place on winning, the most pressure to excel on the hardwood stems from this new authority. 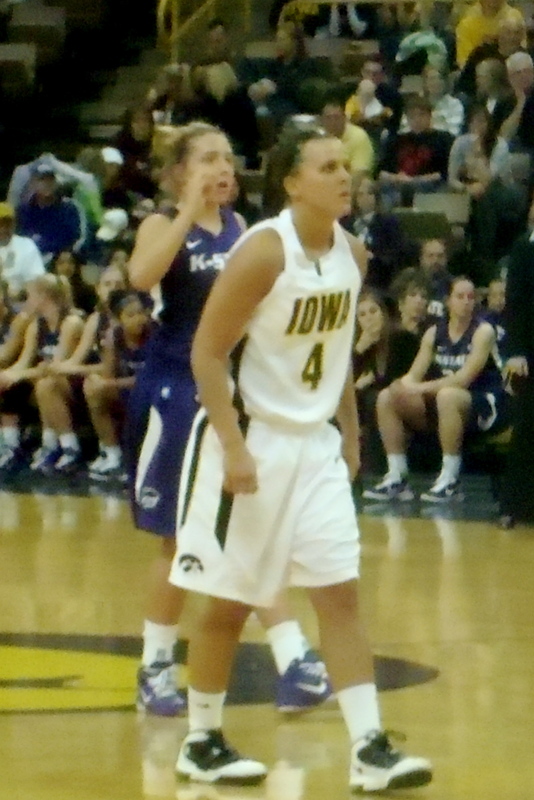 Megan Considine, University of Iowa basketball player, said the previous season’s results have a lot to do with the amount of pressure coaches put on the players. Christina Johnson, Ph.D., and lecturer in health and human physiology, with an emphasis in sports psychology, said because coaches are the most prominent figures in college-athletes’ daily lives, the greater pressure felt from coaches, instead of fans or peers, is to be expected. Despite taking a 15 semester-hour course load, Rukavina, a psychology major, said basketball is her top priority. Rukavina said keeping up with academics can get stressful and overwhelming at times, but overall her schoolwork does not attribute to the pressure she feels as a college-athlete on a regular basis. Ashley Wilson, Purdue University basketball player, said her busy basketball and school schedules can put a lot of pressure on her to properly manage her time. Wilson’s routine consists of class in the morning, a three-hour practice, an hour of weight lifting and then “study table,” the two-hour time slot the team dedicates to keeping up with school work. Wilson said her teachers typically acknowledge her long list of priorities, which helps her relieve some of the day-to-day pressures of being a college athlete. Rukavina and Wilson are both on full athletic scholarships at Illinois and Purdue, which Johnson said can contributes to why college athletes feel obligated to make their sport their top priority. But Johnson also noted the negative to this obligation, because of the small number of college athletes that have a professional future in their sport. When outside the gym, Rukavina, Considine and Wilson are expected to carry themselves in a specific manor. Rukavina and Wilson said their coaches banned the use of Twitter to prevent any mis-communications that might jeopardize their team’s image. Considine said Iowa has not implemented any rules against the use of social-networking sites, but like Illinois and Purdue, Iowa’s coaches have a strict set of behavior rules in place. Aside from behavioral obligations, Rukavina and Wilson said their teams are heavily involved with fans and the community. Wilson said her team interacts face-to-face with the members of “The Boilermaker Network,” a particularly dedicated group of fans, at least five times throughout the season. Because Iowa does not have any professional sports teams, Considine noted the state’s fans strong dedication to the school’s athletic programs. Considine did not see this extra attention as any added pressure, but instead she said the team uses the heavy support to their advantage. 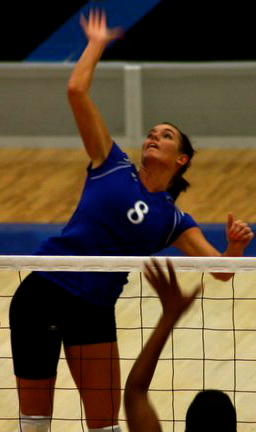 Despite the extra responsibilities, Wilson said she does not regret her decision to be a college athlete. It’s 7 a.m., Monday morning, and junior Leah Conroy is awoken by the high-pitched beeps blaring from her cell phone, an alarm the 20-year-old set just five hours earlier. Conroy finished her closing shift at DC’s bar in downtown Iowa City at 2 a.m. and curled up in her bed after packing her lunch and laying out her scrubs for the rapidly approaching eight hour school day. The UI Radiology student takes classes at the UI Hospital, five days a week, eight hours a day, while also juggling her part-time job at DC’s where she averages 40-hours a week. When Conroy made her decision to attend Iowa in 2008, she was aware of her new financial burden that accompanied being a Hawkeye. But when Iowa City passed its new 21-ordinance in June 2010, Conroy wasn’t ready for the toll the regulation would take on her income. The Byron Ill. native knew she wanted to be a Hawkeye during her senior year of high school. But Conroy was no exception to her two older sisters, Emily 24, Haylee 23, both of whom took complete financial responsibility for their college expenses. Despite working at DC’s for over two years, Conroy said time management has still been an ongoing problem throughout her college career. Conroy said she uses student loans to pay her tuition and depends on her DC’s pay checks for rent and utility bills, parking expenses, groceries, and miscellaneous costs, a total she estimated to be about 600 dollars. Dc’s has always been a 21-only bar, which Conroy said makes the ordinances’ impact less detrimental, but still noticeable. Conroy said prior to the 21-ordinance she earned an average of $70 a night on weeknights and $150 per night on weekends. Football season has helped maintain the weekend crowds in DC’s, but Conroy said she has seen her weekday incomes dwindle to fewer than 20 dollars on certain occasions. Conroy’s roommate, junior Julie Euyoque works at Bo James, another previously 21-only bar. Euyoque too claims sole responsibility for her college finances, and depends on her biweekly Bo James paycheck to cover her bills. Conroy’s roommate said because she works mostly lunch shifts during the week, her income has been dramatically lower because students seem to be avoiding the bars all together. Conroy said her job at DC’s hasn’t been producing enough income to pay her monthly expenses and if the 21- ordinance doesn’t get reversed, she will be forced to seek employment out of the bars. Conroy (left), Euyoque (right), enjoying their time away from school and work. The UI Radiology school’s schedule mirrors the hours of a full-time job, a task that Conroy said she was originally ready to handle. When the junior was accepted into the radiology program in 2009, she had no choice but to quickly master prioritizing school and work responsibilities. Despite the class and work overload, Conroy has managed to maintain a B-average her sophomore year, and said she is steadily improving on that feat. Conroy’s other roommate, junior Amanda Duski, questioned her housemate’s ability to juggler her priorities. This is an article about Owen Thomas, a 21-year old junior who played football at The University of Pennsylvania. Thomas had chronic traumatic encephalopathy, a type of brain damage that is common in professional athletes and leads to abnormal behavior. My first source is Dr. Ned Amendola, the Director of the UI Sports Medicine Center. Dr. Amendola localizes this story because he works closely with the UI football team, so he can talk about how the team handles concussions and similar head injuries that come along with playing football. I went to the Iowa sports website and looked at the football team’s roster and found Dr. Amendola. My second source would be Mr. Chris Doyle, the football team’s head strength and conditioning coach. This CNN article mentioned a lot of precaution’s teams can take to avoid horror stories like the one U of Penn is dealing with. Coach Doyle localizes this story a lot because he can address how, if any, of the drills the team does takes special precautions for brain injuries, and how the team is affected by stories like Owen Thomas’. I also found Coach Doyle off the Iowa athletic homepage on the football team’s roster. Aside from being a full-time student in the UI Radiology school, Leah Conroy works as a cocktail waitress at DC’s Bar in downtown Iowa City. The 21-ordinance has taken a noticeable toll on the junior who is responsible for paying her entire list of college expenses on her own. Despite the drastic increase in college tuition rates and expenses, Conroy still got herself out of the house after high school and off to college despite the historically high-price of doing so. Local blogger for Iowa City’s Press Citizen, Bob Elliott, expresses his approval of the recent ordinance that Conroy blames for her decreases work profits this school year. There are numerous Facebook groups of fellow IC student’s who express their views on the cities 21-ordinance. I found my first article on CBS news. I purposely wanted to reference a national news source because I wanted to compare Leah’s situation with the rest of the population at large. Since the issue of college costs is heavily number based, going to a credible national news source proved to be the best way to ensure my numbers were accurate. CBS was one of the first link thats popped up when I was searching for an article, as we talked about in class that means it had the most views. I wanted to make sure I was referencing an an article that was written by a professional versus one by a high schooler. The second link I referenced was a blog written by The Press Citizen’s Bob Elliott. I went for a more local focus for this link because the 21-ordinance is solely an Iowa City issue, which makes Elliot an expert on the topic. There is no sense in referencing a huge news source like CBS in this case because they do not know nearly as much about Iowa City and what is going on here. I linked my third source to a Facebook conversation about the 21-ordinance. I was hesitant at first to choose Facebook, but because Leah is a college student, and has an account on the site, it seemed extremely appropriate. The conversation offered multiple links to different stances on the 21-ordinance and had a high membership which therefore gave the group some credibility.